Pench National Park & Tiger Reserve, located in the central Indian state of Madhya Pradesh, is one of the most highly regarded national parks in India. It is the famed home to Mowgli from Rudyard Kipling’s The Jungle Book, but it is not Mowgli we have come to see – it is his arch-enemy Shere Khan, the Bengal tiger. Upon entering Pench on our first ever tiger safari, for a moment it feels we have wandered in to autumnal Canada – the deciduous teak forest is shedding its leaves, and the forest floor is blanketed in a thick carpet, a heady array of reds and yellows and oranges, whilst more drift down from above as we pass. But the disorientation is only for a moment – soon a langur monkey leaps across the track in front of us, reminding us exactly where we are. An occasional fig tree, incongruously evergreen, is resplendently emerald in comparison, its thick canopy luminous between the surrounding bare branches and trunks. The dry leaves crinkle and crunch under the hooves of spotted deer – reindeer-esque males with velvet antlers stare as we pass, while their skittish fawns bound for cover behind the protective, elegant does. The beautiful forest colours remind us of autumnal Canada. Soon we are at a rejuvenating waterhole. Egrets, cormorants and ever so colourful kingfishers keep watch from the branches of the surrounding trees, while wild boar snort and snuffle at the water’s edge. We pause for a moment, partly to take in the view, but more to hear the sounds of the forest – in a practice which will become very familiar in coming days, we are listening for alarm calls, shrill high pitched warning cries from the langurs, spotted deer, sambar and other potential prey, when a predator is on the prowl. Soon our ears become accustomed to these sounds, recognising with a thrill a true alarm call (versus the cacophony of other sounds emitted by the jungle creatures), and our excitement builds as our guide turns to us with a smile – “let’s go”! Our first tiger safari was successful, but a qualified success – likely to be memorable as our first ever tiger, but otherwise unmomentous – there was no intrigue, no chase, no tiger emerging stealthily through the forest. Instead, our guides knew of a tigeress seen that morning who was guarding a kill, and so was likely to be in a certain location. By the time we arrive, it seems most of the vehicles in Pench are there, and the raucous parking lot of cars has an almost carnival feel. Resisting the urge to shush fellow onlookers (this is a safari, people) we seek out the tiger. 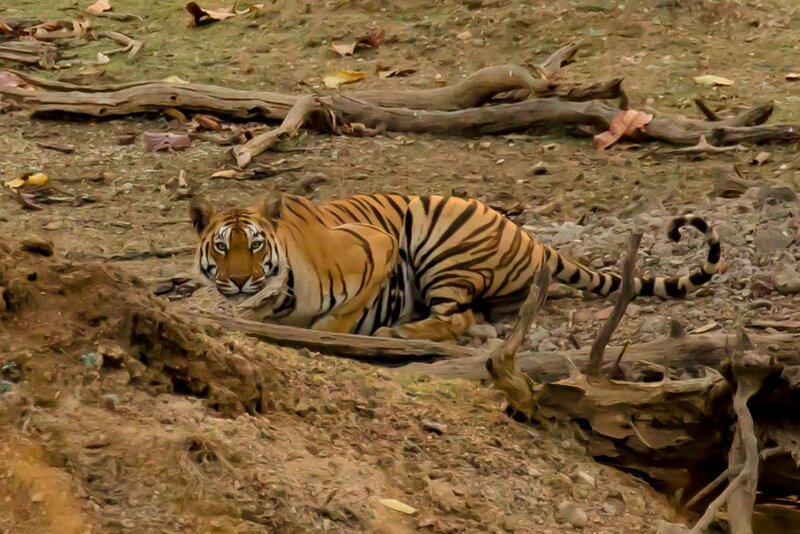 She is there on the opposite bank of the lake, distant, dim in the late afternoon shadows, but definitely a tiger, and we watch (through our ultra zoom lenses) as she snoozes, twitching her tail and batting away flies with her paws. Every so often she lifts her head, which is met by a volley of machine-gun fire photography from our side of the lake. Eventually we must leave, to make it out of the park in time for closing, exhilarated to have seen our first tiger, but determined to see more. On that first afternoon in Pench, the temperature was 41 degrees, and the heat burnt down through the shadeless trees. The landscape felt charred, scorched, impossibly dry, and while impressive, it was not immediately inviting. Despite the afternoon heat, mornings in Pench are surprisingly cool. But the next morning, in the cool of early dawn, the dappled light of the sun’s first rays suffuses the forest with a cool pink glow, and the forest scene is beautiful; in fact, it is nothing short of spectacular. Birds greet the day with a cacophany of different calls, peacocks strut for peahens, and langurs and macaques begin their grooming rituals. The forest is abound with noise and colour, and while tigers remain elusive on this safari, it is a wonderful morning. During our three days in Pench National Park, we undertake six safaris (three morning and three afternoon). We see another tiger our second afternoon – much more authentic on this occasion, having tracked the alarm calls of sambar deer and waited patiently by a waterhole, until, having literally just given up and turned the vehicle around, she finally emerged from the forest to drink. But despite the best efforts of our wonderful naturalist Dhiraj, these were our only two tiger sightings in this park. 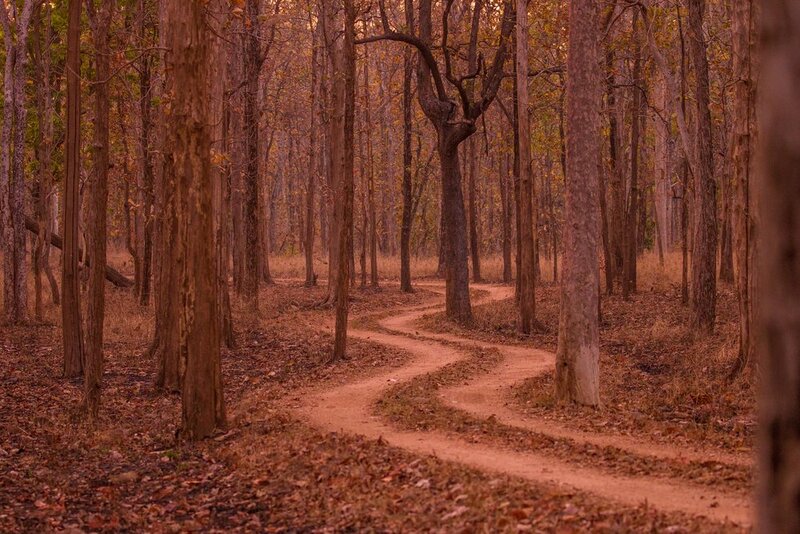 Would we recommend Pench National Park as a destination on your tiger adventure? Almost certainly. While our tiger sightings were limited, and we saw no leopards, wild dogs or sloth bears here, we recognise that this is the luck of the draw on safari, and generally Pench is well recognised for successful outings. In addition, the National Park is well organised and usually uncrowded, and the forest at this time of year is truly lovely, making game drives a pleasure as much for the scenery as the wildlife. Finally, a small contingent of luxury lodges means you will be well taken care of during your visit. For practicalities of the safari experience in India in general, see our (upcoming) detailed post on "Tiger Safaris in India". Pench National Park spans the border of two states in central India, with approximately two-thirds in Madhya Pradesh and one-third in Maharashtra (although it depends which website you read! ), and the two components are administered separately by their respective governments. The Madhya Pradesh side is generally considered superior for sightings and infrastructure. Here the park covers an area of a little under 800 square kilometres, with approximately 300 square kilometres being considered the core region. An additional 465 square kilometres forms the park buffer zone. The Pench River runs through the park from north to south. There are three gates on the MP side of Pench, with the most popular being Turia Gate, on the eastern aspect of the park, where the majority of lodges are located. To the north are the Karmajhiri and Jamtara Gates, although the Jamtara Gate is used almost exclusively by Jamtara Wilderness Lodge (where we stayed, you can read about it in our upcoming post). The park is not divided into any zones (unlike the other parks we are to visit), and vehicles can travel to all areas within the park once they have entered through their gate (although they cannot cross the border between Madhya Pradesh and Maharashtra). The lack of zones means that the entry gates at Pench are less relevant than at other MP parks - you will simply enter and exit the park at the gate closest to your lodge. However, choosing an alternative gate is not really an option - the distance between Turia Gate and Karmajhiri Gate from outside the park is approximately 80 kilometres, a two hour drive on bumpy backroads. The largest number of gypsies (small Suzuki safari vehicles) depart from Turia Gate - approximately 22, compared with 8 from Karmajhiri and 4 from Jamtara, meaning that there can be queues of vehicles waiting to enter the park at Turia Gate, particularly in the morning. However, once inside, the vehicles disperse quickly within the large park, so rarely does it feel crowded. Inside the park, a well maintained network of tracks criss-cross the terrain – however, it should be noted that the very central section of the park has no roads, and is not accessible to tourist vehicles. In addition, the total number of tracks is quite small, with large swathes of forest in between, so it is very easy for a tiger to remain hidden in the forest, well out of sight of any peering eyes from the roads. Going off-road is definitely not an option - the vehicles are now all GPS-tracked via an app, and vehicle movements, including their speed, are monitored closely. Guides who disobey the stringent park regulations can be fined or even banned, and the park management should be applauded for their efforts to improve conservation and safety within the park. Also within the park, there is a surprisingly large amount of human habitation. While the villages that used to exist within the park boundaries have been relocated since the park's declaration in 1992, and have now returned to grassland, there are multiple huts for rangers, researchers and other employees, and unfortunately, most have not been constructed with any sensitivity for their beautiful surroundings. It is also a little disconcerting to be looking for tigers, and to come across workers on bicycles or on foot! In the centre of the park is a central clearing with multiple buildings including a watchtower, bathroom facilities, staff quarters and souvenir stalls. Here, vehicles congregate each morning for breakfast under the fig trees. While this is admirable in that it means eating and stopping is prohibited in the rest of the park, it does become a somewhat raucous affair. Breakfasts are served on the bonnets of the vehicles, and while each lodge varied in their provisions, ours was a bounty of samosas, stuffed parathas, boiled eggs, bananas, juice and coffee. The park is open from mid-October to June 30. Each day, the park opens for a morning safari and an afternoon safari, with times varying according to the month - opening as early as 0530 in May and June and as late as 0645 in January, but always closing at 1100, before re-opening in the afternoon between 1500 and 1600, and closing for the day between 1730 and 1900. The weather in the park varies considerably from October to June. Of note, December, January and February can be bitterly cold in the early morning (as low as 2-5 degrees) and whipping through the forest in an open-top vehicle can be a frigid experience. Wrap up warm (thick coats, gloves, scarves and beanies) and take advantage of the blankets and hot water bottles provided by the lodges. In April, daytime temperatures start to reach 40 degrees, and even though the reported minimums are apparently a balmy 20-24 degrees, it is still surprisingly brisk at 0530, with a jumper and blanket still needed. While we were worried about being baked to a crisp in the roofless vehicle, it only seems to warm up considerably in the last hour of the morning safari. And by the time we headed out again for the 1600 safari, the fiercest heat had dissipated, and the evenings were eminently pleasant. So saying, please remember to wear sun protection - particularly in Pench where the deciduous trees means shade is sparse. In regards to the wildlife, Pench is home to large numbers of spotted deer, with the antler-bearing males striking a particularly regal pose. There are good numbers of stockily-built sambar, which are the largest deer in India. Langur monkeys abound and are great fun to sit and watch, particularly the young babies playing with their older siblings. Less prevalent are the rhesus macaques, though they also like to put on a show from time to time. There are leopards (though very elusive), sloth bear (equally elusive), wild boar, mongoose and gaur (pronounced "gore") - huge, wild cattle also often referred to as Indian bison. There is also of course a large diversity of birds including the colourful kingfisher and the luminescent Indian roller, who in particular provide plenty of fun (and frustration!) as we attempt to photograph them in flight. Precise numbers are difficult to achieve, and reports also vary, but from our understanding there are currently somewhere up to 60 tigers in the Pench Tiger Reserve. So this is less than in Kanha and Bandhavgarh, the other two parks we visited, we will write about both in upcoming posts, but due to the good management of the park the numbers are increasing all the time. Tiger sighting in any park is all about hours invested, and then luck. But for those of you who are familiar with African safaris, there is nowhere near the density of big cats that you will find in the national parks of eastern and southern Africa. Tigers are by their nature solitary, competitive and territorial – they rule ruthlessly over their own range. They are also often quite wary of humans. So please read our blog on realistic expectations when undertaking an Indian tiger safari. Our personal experience in Pench was that the tigers were harder to find, and then when we did they were further away from us, than at Kanha and Bandhavgarh. Having said that, our guide assured us that the previous week, when parked in the same spot where we were watching a tiger some 100 metres away, a large male had walked right by the vehicle no more than 5 metres away! So again, as we say, it all depends on your luck on the day. So while the main purpose of your visit to Pench may be the search for tigers, don’t forget to just stop and sit for a while. When you aren’t moving, it is truly amazing how many of the forest inhabitants come to you, providing some of your best photo opportunities, not to mention the most enticing opportunities to experience and appreciate all the park has to offer. Any water is good water when its this hot!